In setting out to write this article, I have the modest goal of helping new collectors of Roman Imperial coins to interpret the inscriptions on their coins. I must state at the outset that there will be nothing new here, I travel the well marked path of the great numismatists who have gone before me. The two who have had the greatest influence on me have been David R. Sear and Zander H. Klawans. Reading and Dating Roman Imperial Coins by Zander Klawans has been the starting point for more Roman collectors than perhaps any other book of the last half century and the fact that it is still in print is a testament to it's value. Many new collectors and even advanced students of Latin shy away from attempting to decipher the seemingly cryptic inscriptions found on most Roman coins. The reason for this initial apprehension is that the ancient Romans were excessive abbreviators and that the legends were run together without stops or breaks. However, by learning less than a dozen abbreviations and developing a familiarity with that names used on Imperial coins the collector can easily attribute most coins that he will encounter (provided the inscriptions are legible). First we will look at the meaning of the more common abbreviations and then examine the names of the emperors as they appear on the coins. The ancient Romans were great lovers of titles. In order to fit the many titles of an emperor on a medium as small as a coin, it proved necessary to abbreviate those titles heavily. Often a title of several words will be trimmed to just a few letters. In the table below I have listed the most commonly encountered titles and briefly explained their meaning. While some of the following titles may sometimes appear on the reverse of coins, generally reverse inscriptions are beyond the scope of this article. AVG AUGUSTUS - The name of the first emperor bestowed upon him by the Senate in 27 BC. It became a title for all successive emperors. During the later empire, senior emperors were called the "Augustus" while junior emperors were the "Caesar." 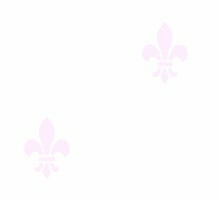 CAES CAESAR - The family name of the first imperial dynasty, it became a title used by later emperors. During the later empire, senior emperors were called the "Augustus" while junior emperors were the "Caesar." PM PONTIFEX MAXIMUS - Highest priest of the Roman religion. This title once conferred was held for life. TRP TRIBUNICIA POTESTATE - Tribune of the Roman people, literally the representative of the people in the government. This title was held for one year and is often followed by a numeral which indicates which term as Tribune the emperor was then serving. It is a useful tool in dating coins. PP PATER PATRIAE - Father of his country. COS CONSUL - The consuls was the chief magistrates of the Roman government. Two were appointed each year. This title is often followed by a numeral which indicates the number of times the emperor had held this position. It is another useful tool in dating coins. CENS CENSOR - A title often held for life. The Censor determined the size of the Senate. GERM, BRIT, et cetera GERMANICUS, BRITANNICUS et cetera - Conqueror of the Germans, Britons et cetera. DN DOMINUS NOSTER - Our Lord. IVN JUNIOR - The younger. PIVS, PF PIUS FELIX - Dutiful, patriotic. OPT OPTIMO PRINCIPI - The greatest ruler. VC VIR CLARISSIMUS - The most illustrious ruler. SC SENATUS CONSULTUS - Usuailly appears on the reverse of bronze coins of the early empire. Bronze coins were issued under the authority of the Senate while gold and silver was issued under imperial authority. The following examples will demonstrate how some of the above titles appear on actual Roman coins. The inscription IMP CAESAR VESP AVG COS V CENS could be loosely translated "The Emperor Caesar Vespasianus, Augustus, Consul for the fifth time, Censor of the Roman people." 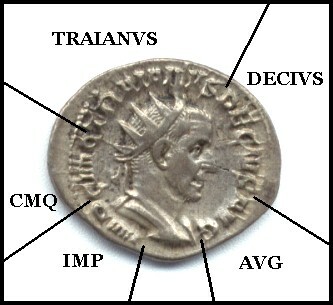 The inscription IMP CMQ TRAIANVS DECIVS AVG could be translated "The Emperor Caius Messius Quintus Trajanus Decius, Augustus." 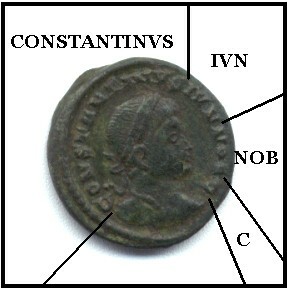 The inscription CONSTANTINVS IVN NOB C could be translated "Constantine the Younger, Noble Prince, Caesar." This coin was issued while Constantine was junior emperor (Caesar) under his father Constantine the Great, who was the senior emperor (Augustus). 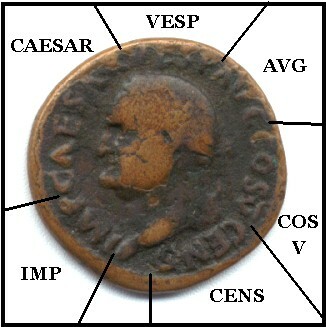 The Following table presents, in chronological order, the common name of the emperors along with the manner in which they often appear on his coinage. Many Roman coins will have incomplete or unreadable legends, however it is still possible to identify many of these coins. The Romans of the early imperial period were know for their veristic portraiture and until about AD 250 most coins can be identified by the style of the portrait alone. In fact many first century coins are so realistic that emperors are portrayed with wrinkles, warts and even double chins. By the later empire, artistic sensibilities had evolved to a more philosophical expression. It had become fashionable to depict a representation of the emperor rather than a true portrait and thus we rely more heavily on the inscriptions on the later imperial coinage. As an aid in doing this I recommend Reading and Dating Roman Imperial Coins by Zander H. Klawans. 2003 WNCCOINS.COM. All rights reserved.